Today, I'm gossiping about Victoria Beckham's Victoria Line that was just show at Fashion Week (NYC). She has amazing style and I think she is a gifted designer. Her clothing is beautiful. I'm in love with her Victoria, Victoria Beckham Fall 2013 line that was just shown at Fashion Week NYC. The look is borrowed from the boys but still feminine and fun. LOVE IT!! Love the dress over leggings look. 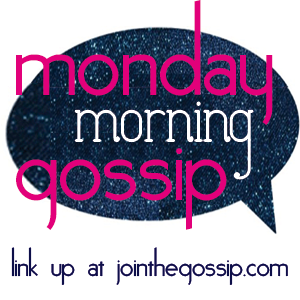 Much thanks for Leeann for having me join up for Monday Morning Gossip!! PS-Brunch was FANTASTIC!! Will post about it shortly!! I LOVE IT ALL! That second look is my favorite, although I'd take any piece. I truly love her line. SO approachable! Oh wow, I love it all. I've never been a huge a fan of hers but I have to say this line is awesome! Here from Leeann's linkup. :) I think Victoria is fascinating, but this collection isn't quite my thing . . . a little too English school girl for me. I'm glad you blogged about it, though, cause I hadn't seen any of the pieces! I love Victoria Beckham! She is one of my top fave designers. Her look is always classy and sophisticated.